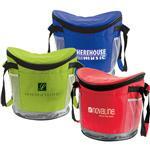 The Custom Chromatic 6 Pack Cooler Bag - a great new promotional cooler with your logo. Two tone solid with grey color combination. 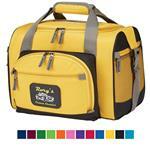 Made of 70D polyester, 3mm foam insulation, silver PEVA lining, with 20" striped handle. Heat sealed. Front slip pocket. Actual size is 6"h x 8-1/2"w x 6"d.
Available Colors: Blue, Red, Kiwi Green, Black, Orange with grey trim. Production Times Available: Free 3-DAY RUSH PRODUCTION AVAILABLE! 5-7 Working Days with paper proof. 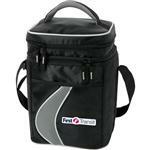 Dimensions: 16"h x 8-1/2"w x 6"d.
Made of 70D polyester, 3mm foam insulation, silver PEVA lining, with 20" striped handle. Heat sealed. Front slip pocket. Actual size is 6"h x 8-1/2"w x 6"d.